August 16, 2014 / Rachel C.
Okay, wow. I wanted to take a break after I finished with the 31 Day Challenge and my OMD2 posts, but I definitely did not mean for that to turn into an 11 day absence! But now I’m back and brought with me a few swatches from ellagee’s A Good Man collection. I guess I’m a little late in posting these since a new ellagee collection has been released while I was taking my break, but I’m still going to show these polishes off anyway since I love them. 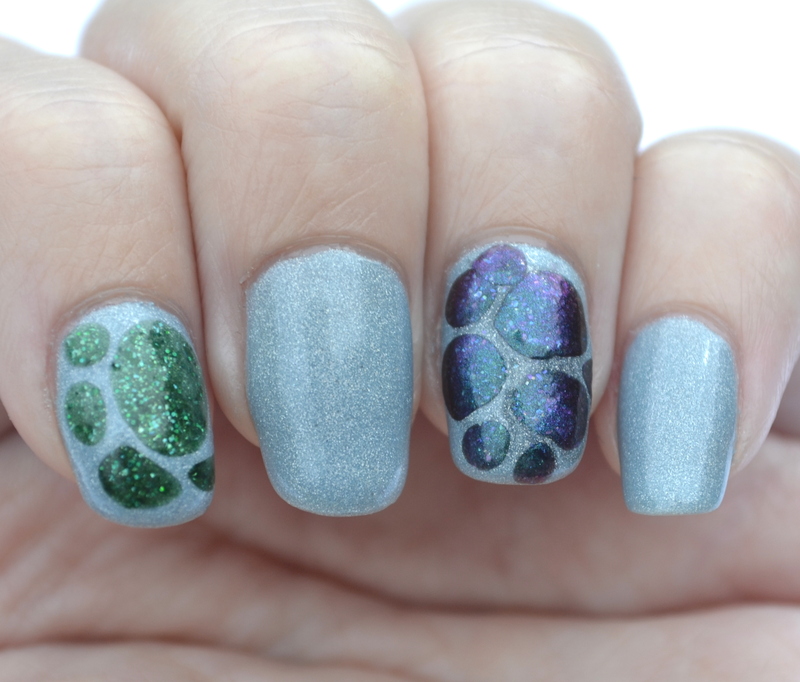 I’ve used three of the four in nail art before, and in some ways the nail art actually shows off a couple of them better than these photographs. Because to be honest, these photos are all over the place. I take my photos outside, and the weather has been so unpredictable lately that my pictures are mostly not consistent or color accurate. But they are still pretty, so there is that. First up is one of the collection’s limited edition polishes, Hold Tight And Pretend It’s A Plan. 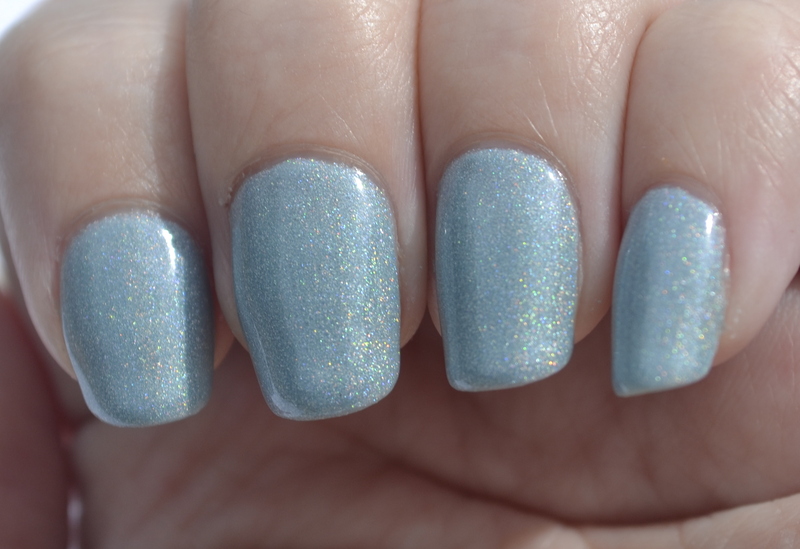 The pigments for the LE polishes have been discontinued, but I just visited the ellagee website a little while ago and noticed that a new version of this particular polish has been released with a slightly different color shift. The difference is so minimal that I would definitely suggest buying version 2 if you didn’t manage to snag the original version. 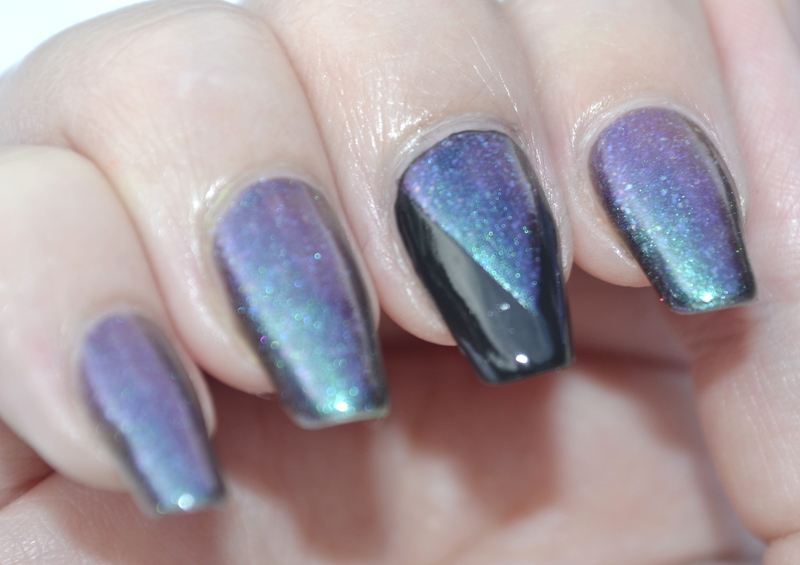 This is really not a polish to miss out on, whether you like multichromes or not. It is stunning, and is tied for the position of my favorite of these four. Anyway, Hold Tight And Pretend It’s A Plan is a multichrome polish with small iridescent flakies. It mainly shifts from teal to purple, but I have noticed that the color range also includes blue and, more rarely, red/orange. 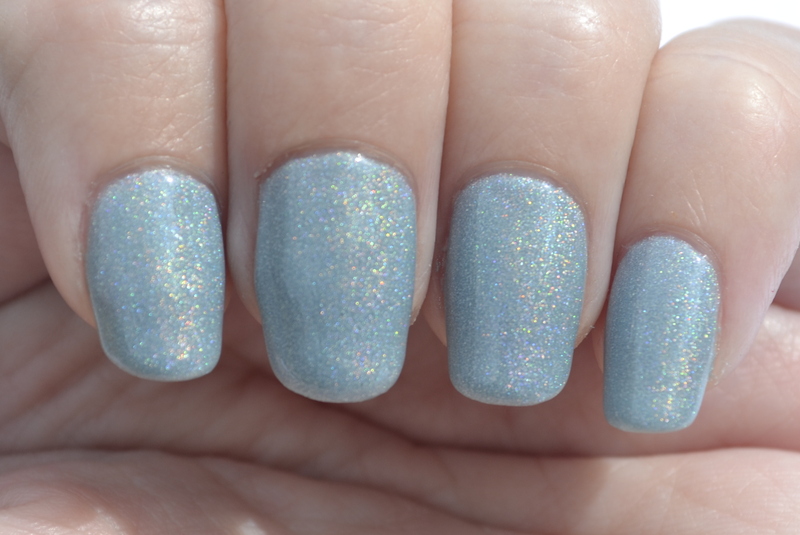 This is one of the polishes that I mentioned that look better in my previous nail art than in my swatches here. 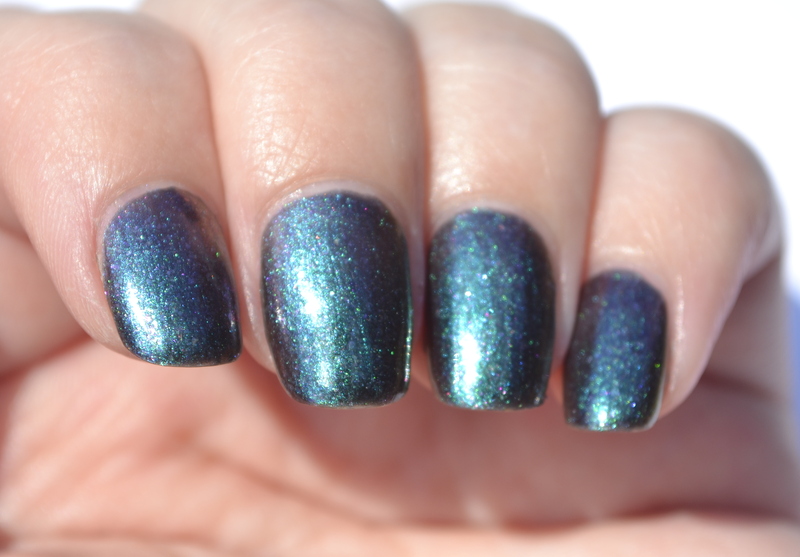 In fact, go look at my OMD2 Duochrome post for better depictions of this polish. I used three coats in these pictures, although two would have been fine. And just for reference, here is one of the pictures of Hold Tight And Pretend It’s A Plan as used in the OMD2 Duochrome post. 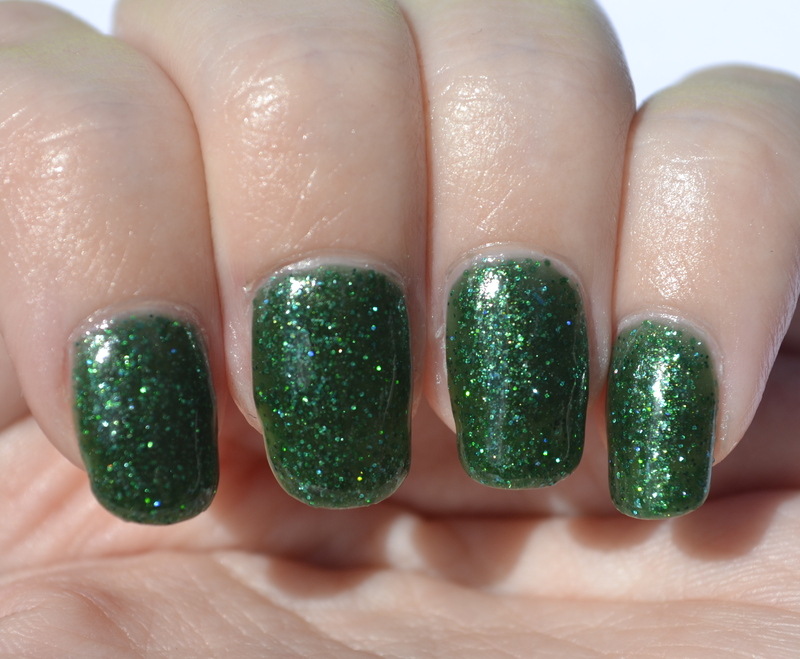 You can see the flakies a bit better in this photo, and the polish is overall a bit more color accurate. Next is Void Stuff, which is dark green jelly base packed full of (mostly green) glitter. I used three coats here, but again, two would have been fine if you don’t mind visible nail lines. This is easily one of the prettiest greens I own! The last time I used Void Stuff (in my Cybermen vs Dalek nails for the 31DC) I swore that I would use a base color next time I used it, but I ended up not doing that for the above swatches. So I did on my thumb nail instead. 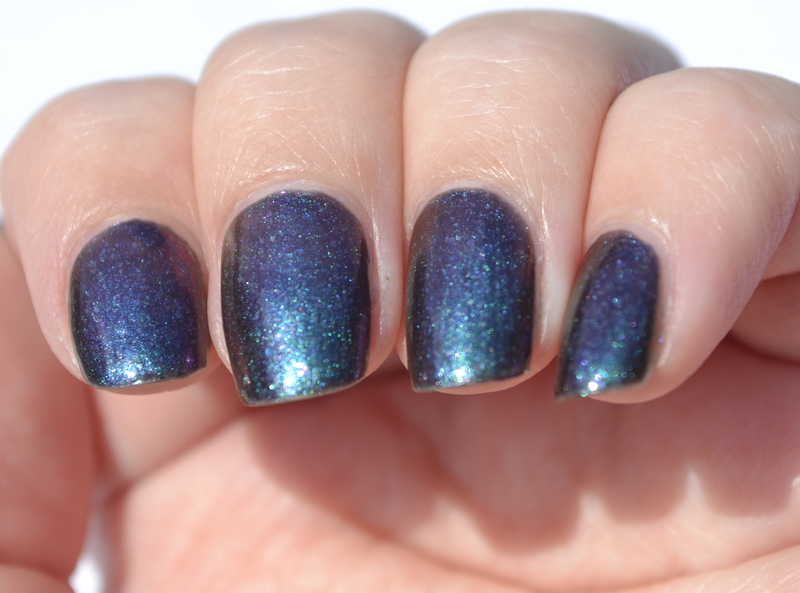 This is two coats of Void Stuff over two coats of Wet n Wild SaGreena the Teenage Witch. There wasn’t too much of a difference between the nails with no undies and the nail with a base color, but I did notice in person that the thumb nail seemed to be a teeny tiny bit of a deeper green. What’s With the Glasses? was a real surprise for me. 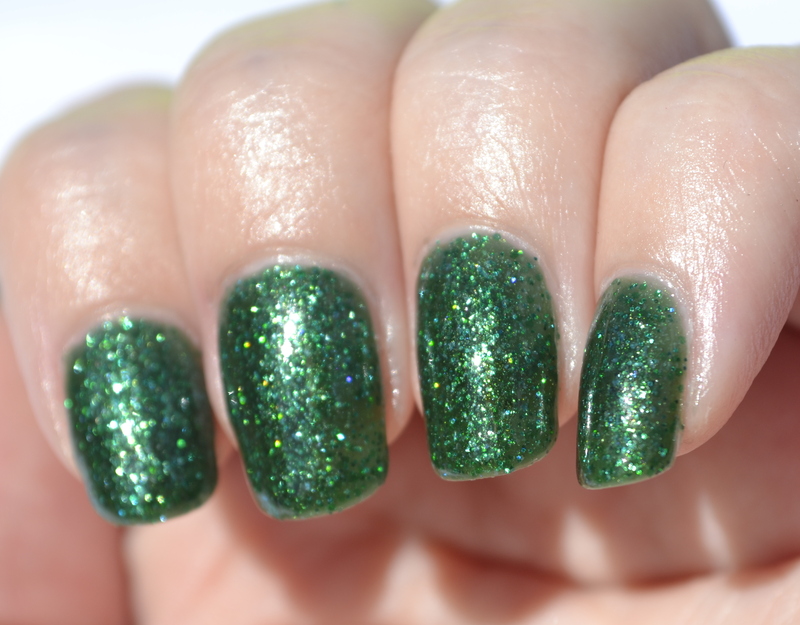 As I was looking through the collection, this polish unexpectedly jumped out at me and it somehow made it onto my buy list. I normally don’t go for glitter polishes like this, but I am so glad that I bought it. It took about an hour of wearing it to realize that I actually really really liked it, but I got there eventually. What’s With the Glasses? 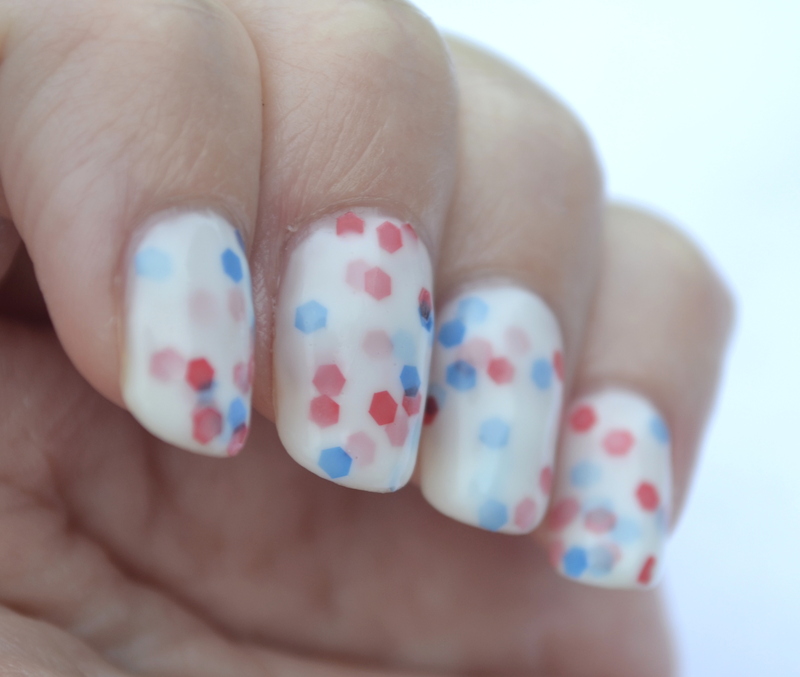 is a white crelly with large red and blue hex glitters. It was pretty sheer so I used four coats. The glitter distribution was a bit too much with four coats though, so I left my right hand at three coats. 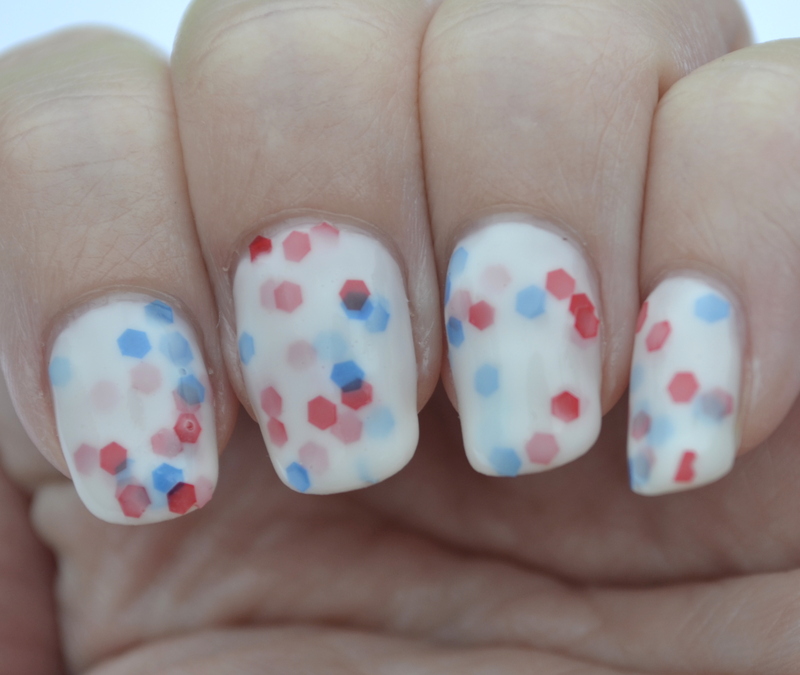 Opacity looks okay in the photos too, so I would probably recommend three coats instead of four. 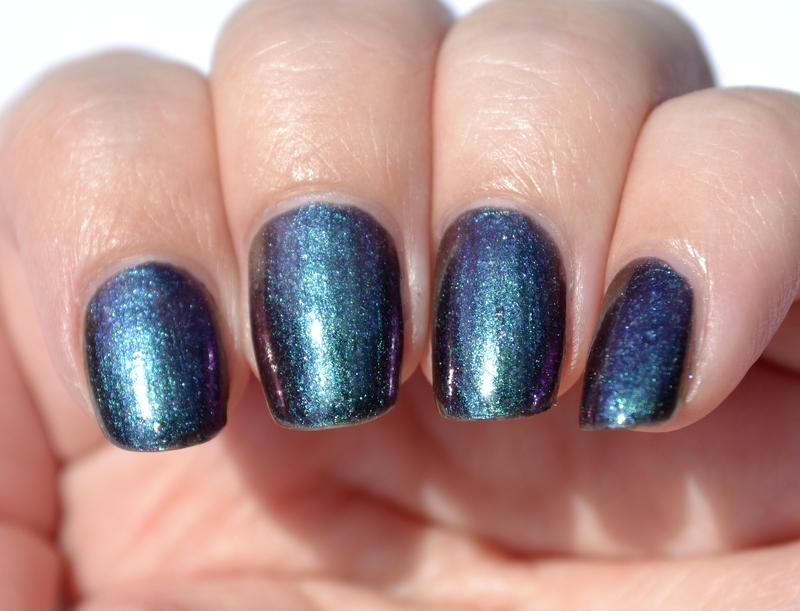 The last polish that I bought is called Trenzalore and is also the third polish that I have used previously in nail art, so it has appeared on the blog before (in my OMD2 Funky French and Holographic posts). This also happens to be one of my favorites (tied with Hold Tight And Pretend It’s A Plan for top spot). Seriously, this polish is gorgeous. 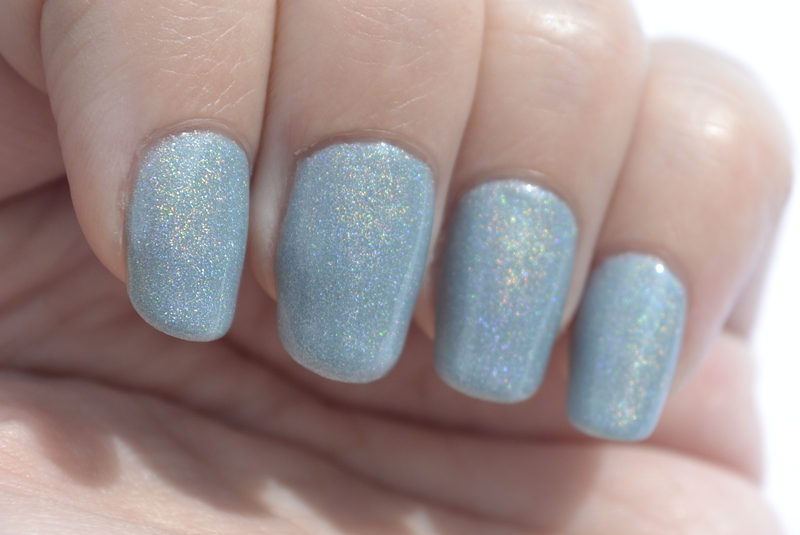 Trenzalore is a pale blue scattered holo, and as noted on the ellagee website, the blue does have a smoky sort of quality to it. It is shown with three coats here. 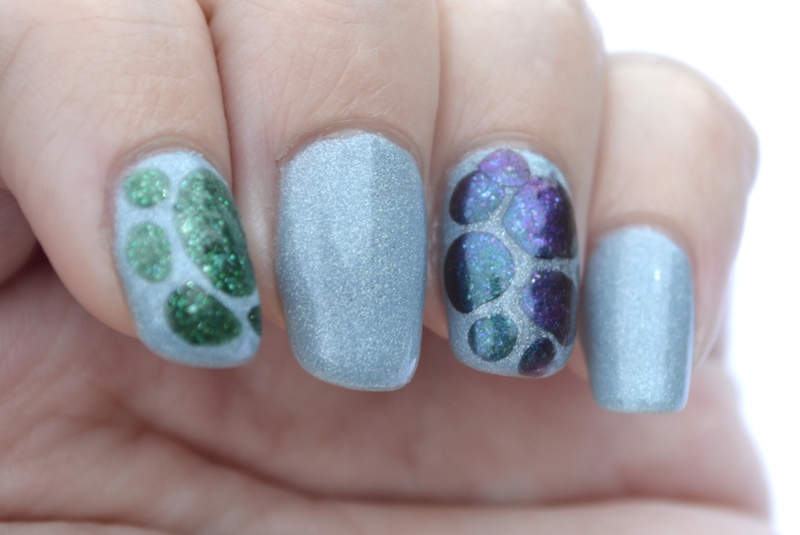 And as if this post wasn’t already too pic-heavy, I decided to do some quick nail art with three of the polishes. With Trenzalore as my base color, I did two blobbicure nails with Void Stuff and Hold Tight And Pretend It’s A Plan. 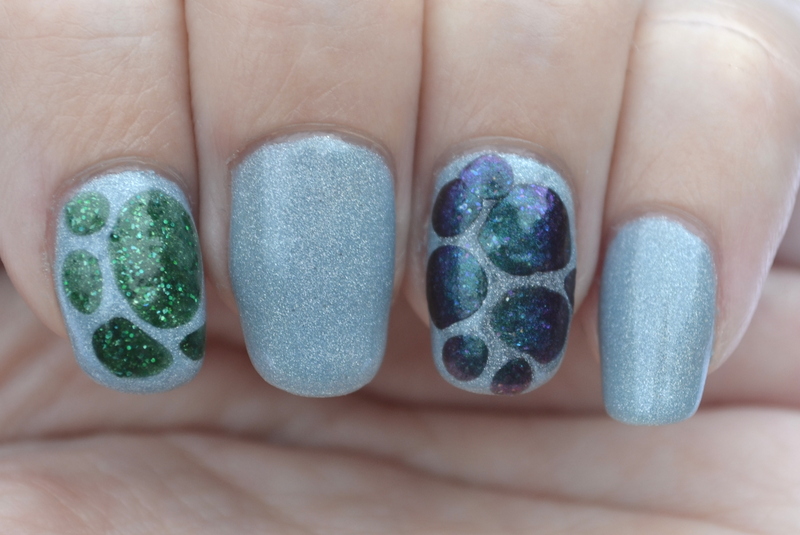 This nail art shows off all three polishes really well. 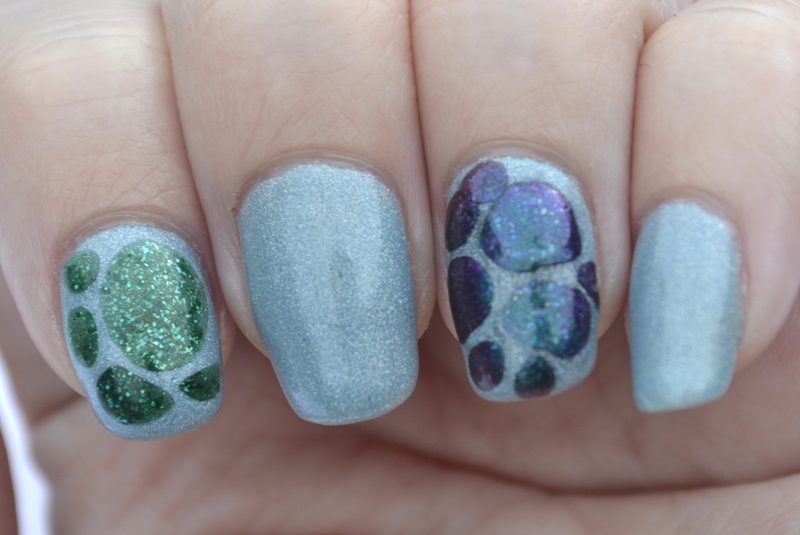 The color shift and flakies in Hold Tight And Pretend It’s A Plan are much more prominent in the blobs than they are in the actual swatch photos. And I personally think that Trenzalore looks good with both of the other polishes, even if the other two possibly wouldn’t work so well together without Trenzalore acting as a buffer. The A Good Man collection is currently available on the ellagee store, minus the original LE polishes (but plus the new Hold Tight And Pretend It’s A Plan). Even though I haven’t tried any outside of these four polishes, I would suggest buying as much of the collection as possible. They ALL look so pretty! 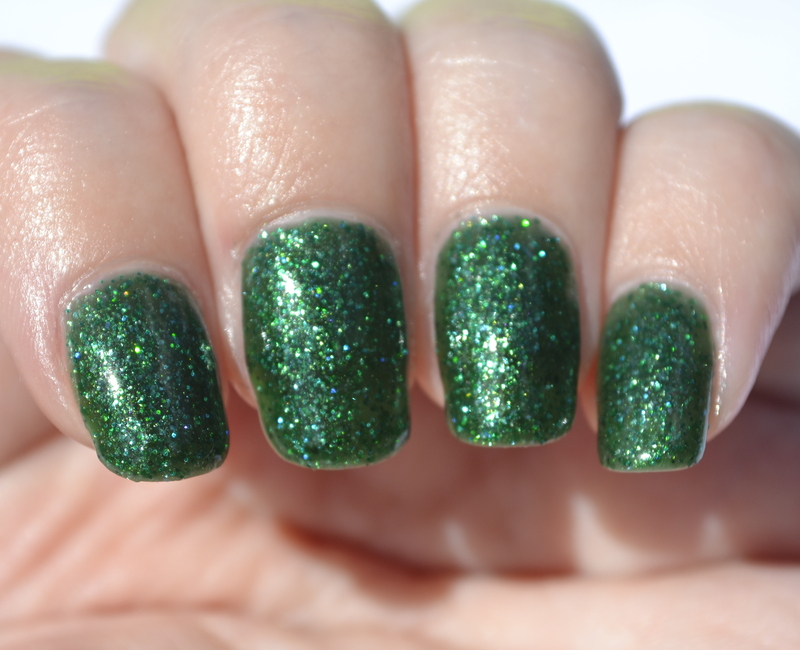 ← The Great Polish Giveaway of 2014!